It's Dr Seuss's birthday on 2nd of March. I'm sure this famous children's author needs no introduction. I remembered reading his books when I was young. And my boys know a few of his classics ones as well. I chose to make Lorax in celebration of his birthday, because I had actually wanted to make it around a year ago when the Lorax movie came out but somehow it was not done. Lorax is made out of cheese and nori. Barbaloots are made from bread and nori. Pink rice was coloured with sakura denbu, my boys used to hate this, but I noticed they did not seemed to mind when I used it in my heart shaped sushi a while back. Yellow rice is coloured with egg yolk and a bit of tumeric. Lorax is standing on fried chicken, and there's broccoli on the sides. 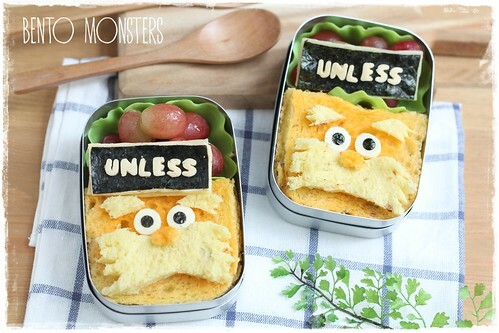 Lorax sandwiches for my boys' snacks later in the day. These are ham and cheese sandwiches. These are pumpkin bread, I sprayed the bottom layer with a bit of Wilton orange mist. 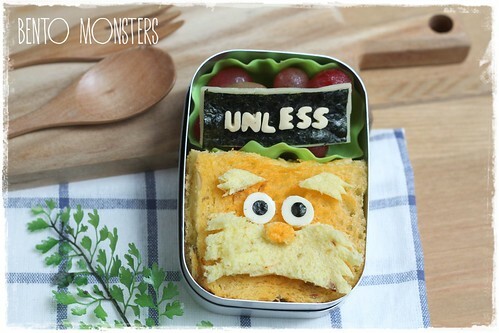 I had wanted to add the words 'unless' below Lorax on the earlier lunch, but I was rushing out to fetch LT from School, so had to add the words in these snack bentos done later in the day instead. Great idea and beautifully done. I not familiar with this character but he is so cute here! 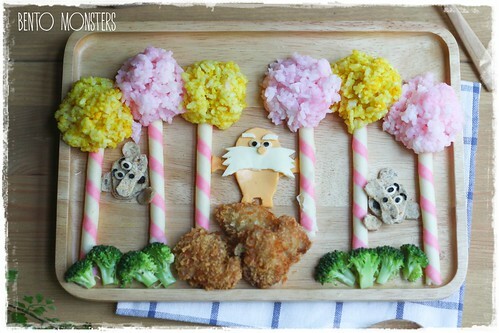 So cute, love the truffula trees and Bar Ba Loots! I love the colourful truffula trees and your Lorax so cute with two arm touching the trees! Always loved your creation! Both of these are amazing! 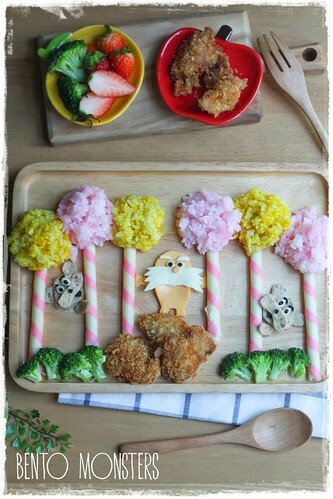 I love the Lorax on top of the chicken and those trees are fantastic!